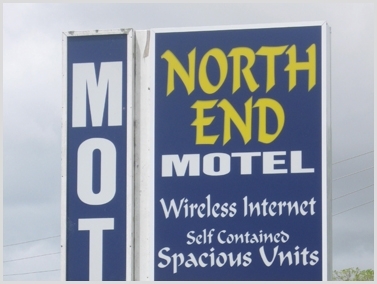 Located 60 mins from Auckland and Auckland International Airport, 30 mins from Hamilton, 20 minutes from the largest shopping centre in NZ - The Base/Te Awa, 45 mins from Hamilton Airport and Mystery Creek, North End Motel is an ideal and convenient stopover place for your stay in the Waikato or NZ. Only 5 mins to Huntly Placemakers Speedway and fewer than 15 mins to Hampton Downs Motorsport Park and Meremere Dragway, North End Motel is also the perfect place to stay for all the "petrolheads" out there as between the 3 racetracks, there are events on almost every weekend of the year. Huntly boasts a multi million dollar heated swimming pool complex with fitness gymnasium open 11 months of the year, which is located next to a large domain with a skateboarding bowl, childrens playground, soccer and Yacht clubs and leads onto Lake Hakanoa. Huntly also has an RSA and a Workingmens Club which both provide a courtesy van. Huntly is a coal mining town with a population of approximately 7000. It is probably best known for its Power Station - the largest power station in the Southern Hemisphere. You can visit the Huntly Coalfields museum to learn more about the history of mining in Huntly. There are several lakes and walkways nearby for those who like to get back to nature including Lake Hakanoa Walkway which is very flat and scenic and takes approximately 45 minutes, you could hike the Hakarimatas or walk around Weavers Lake which takes approximately 60 minutes. Both Hakanoa Lake and Weavers Lake are also excellent for most watersports and fishing. Other attractions nearby include Waterworld (the largest swimming pool complex in the Waikato - approx 25 mins), Candyland, where children can make their own candy (approx 15 mins) and the Bush Tramway Steam train in Pukemiro which runs once a month on a Sunday (approx 20 mins). For more information on current events in the Waikato, please check out www.hamiltonwaikato.com. We offer cooked to order breakfasts and dinners. Menus are in the rooms and can be ordered at the reception. Hot coffee is also available. Minimum room rates/stay periods may apply. All major credit cards and EFTPOS accepted.